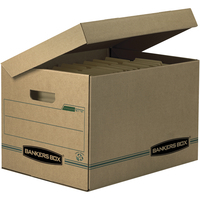 Fellowes Systematic Letter/Legal Storage Box measuring 12 in x 15 in x 10 in features a basic-duty construction for moderate stacking. Kraft/green storage box made from a high%age of recycled material features an attached flip-top lid to avoid lost or damaged lids. Box is sold as 12 per pack.